Since the birth of the smartphone and tablet markets, the potential for software developers to strike it big with that one popular app has lead to an explosion of freelancers and programmers working in the app development industry. The field of app development is particularly attractive when one considers that the potential devices a developer can sell to is likely to expand further. In the future, app developers expect there will be a strong market for an even greater range of electronic devices than tablets and smartphones, expanding to include televisions, connected cars, game consoles, and VR devices. For the moment, one thing is clear: this is a market that is constantly expanding and evolving. On average, there are more than 30 thousand new apps submitted to the iTunes App store alone each month and still more written for competing platforms such as Android and Windows. 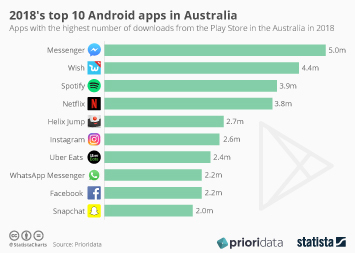 By mid 2016, around 130 billion apps had been downloaded from the Apple App store worldwide and approximately 65 billion apps had been downloaded from Google Play. In the past, the market has been dominated by apps that are free to download and this appears likely to continue into the future. Generally, such apps make their profits through advertising, sponsorship, the possibility for in app purchases or paid extensions or upgrades. A significant share of users seem to be to upgrade to a paid version of an app. Some of the most popular apps around the world, that also happen to be free for the user, include; Google Maps, Facebook Mobile App, YouTube, Twitter and Google+. However, not all platforms are equal in terms of revenue opportunity for app developers. A 2015 survey of app developers and publishers revealed that average revenues per app were highest for those developed for the Windows Phone, with iOS apps generating approximately a third less in revenue, and Android apps less than half that of Windows.